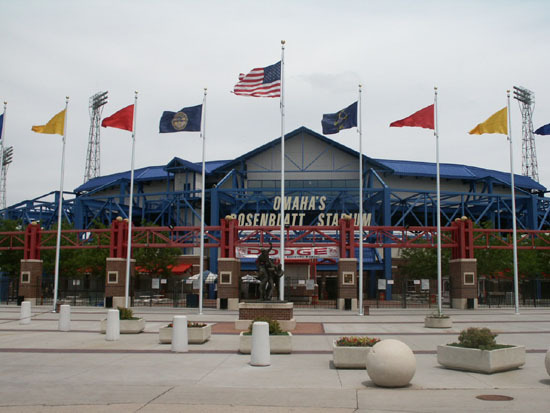 The Omaha Royals, a Triple A affiliate of Kansas City, play at Johnny Rosenblatt Stadium which was built in 1947. 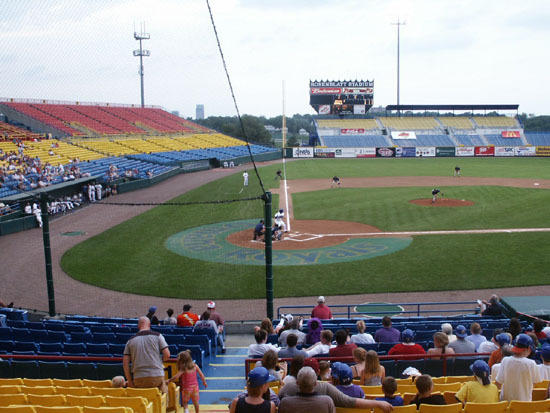 It is a very colorful stadium with blue, yellow, and red seats. 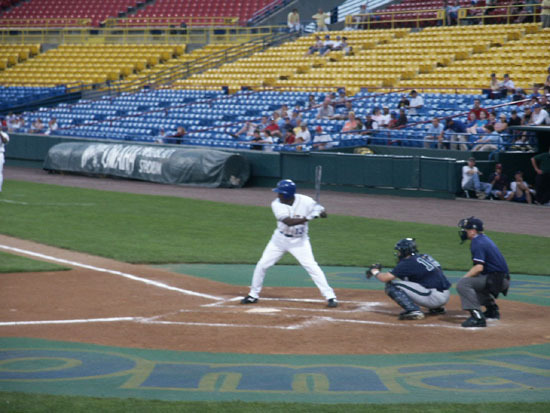 Most of the seating is not used for regular games. 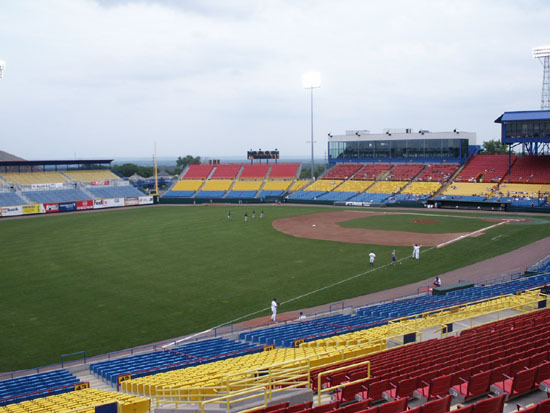 But during the College Baseball World Series each year in June, the stadium is jammed. 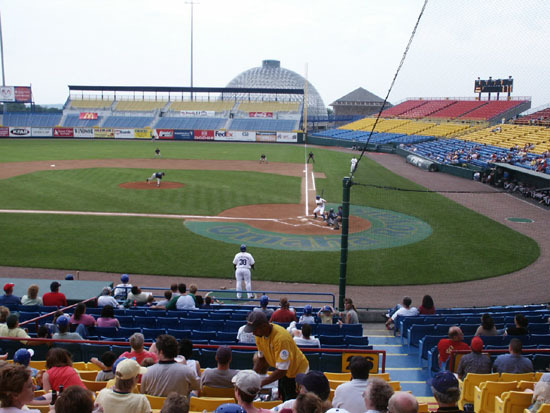 There are seats in the main part of the stadium and bleachers with backs in the outfields. 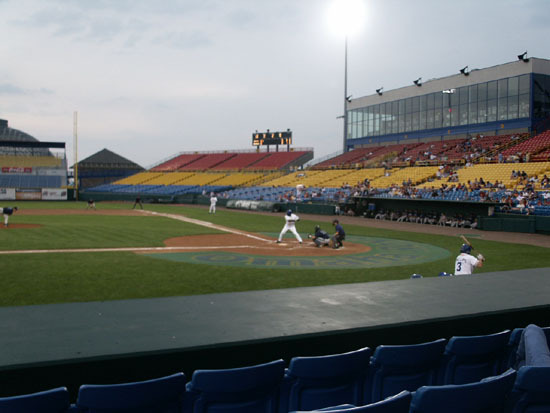 There is a restaurant behind the seats on the first baseline which has memorabilia from the stadium and the College World Series. 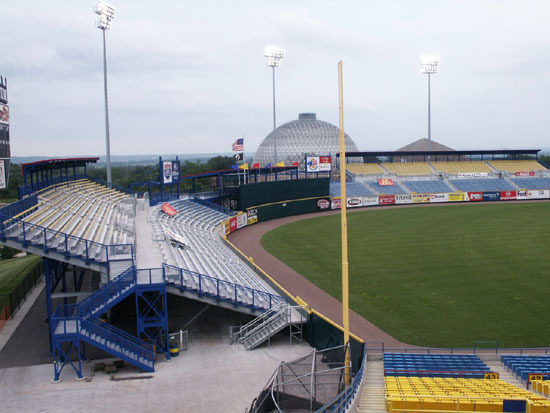 The pressbox and suites are on pillars behind the red seats. 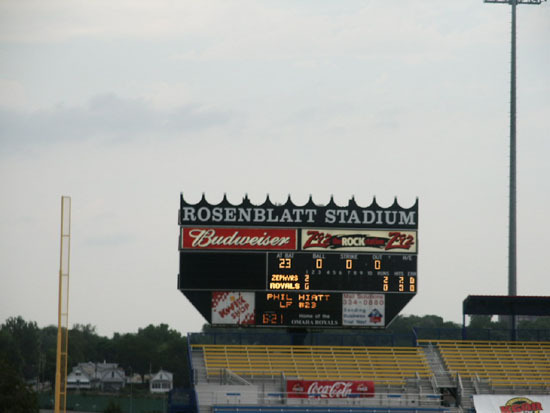 It was in the mid 80's, cloudy, and windy at the start of the game. The Omaha area was under a tornado watch. It started sprinkling during the 4th inning, so we moved from our blue seats four rows behind the home dugout, up to the red seats under cover. 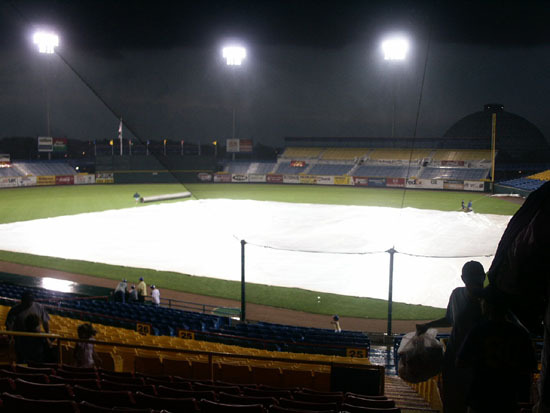 It kept raining, but was blowing so hard that the field wasn't getting very wet. 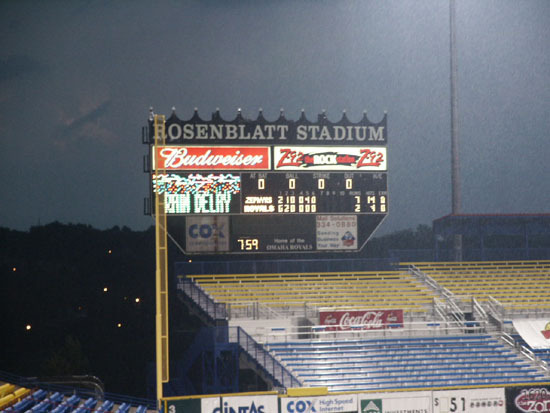 Finally at the end of the 6th inning, when there was a lot of thunder and lightning, they called a rain delay, covered the field, and asked everyone to move to the concourse under the stadium. Most of the fans left, but some hung out in the concourse eating funnel cakes and pizza. 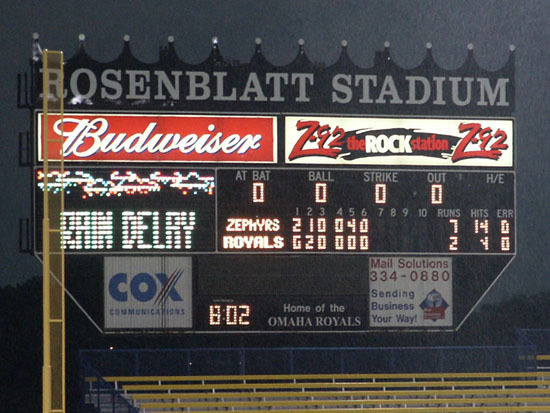 After a 45 minute delay and when the rain and water started blowing down the ramps into the concourse they called the game. 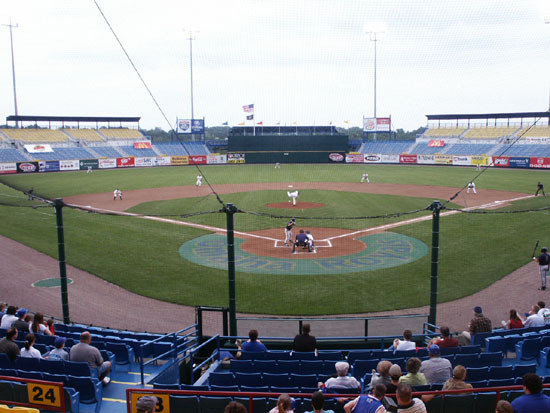 The Royals were playing the New Orleans Zephyrs and lost 7-2. 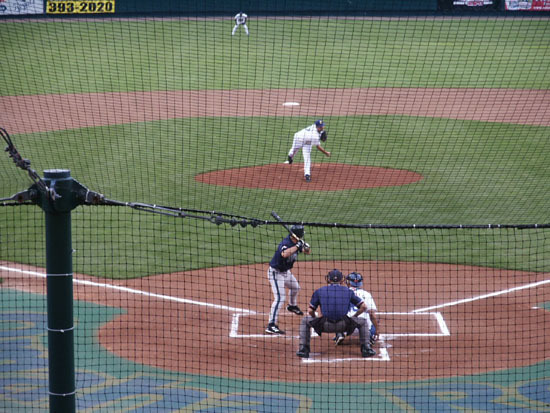 The Omaha pitcher was really laboring and the defense was none too sharp. 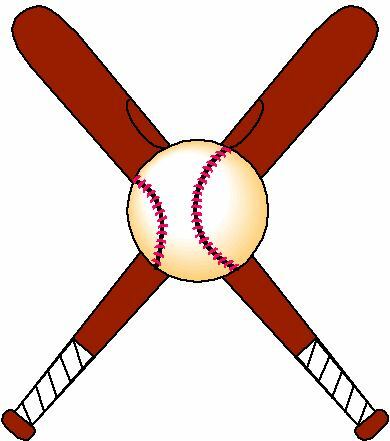 The box score was Zephyrs R-7, H-14, E-0 and Royals R-2, H-4, E-0. 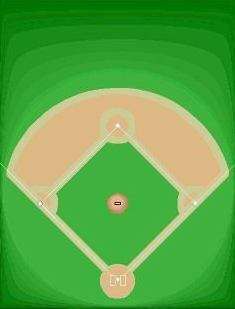 The field lines are RF & LF-335' and CF-408'. 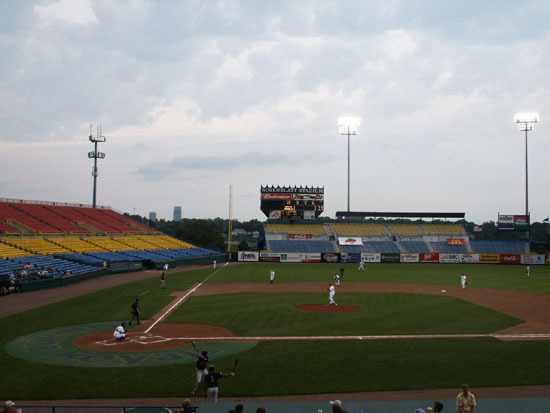 The attendance for the game was 3,266. 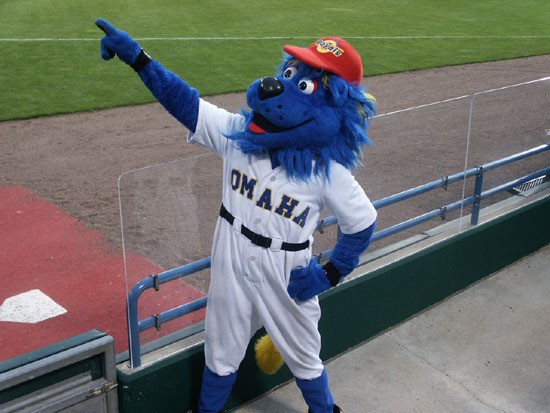 Casey is the mascot, the first blue lion we have seen, but he does have some yellow highlights in his blue mane. 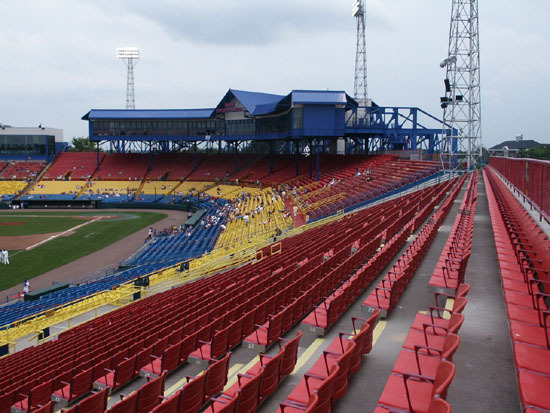 Attending the game, right side of picture, is a gentleman, who at age 20, attended the opening game at Rosenblatt Stadium. 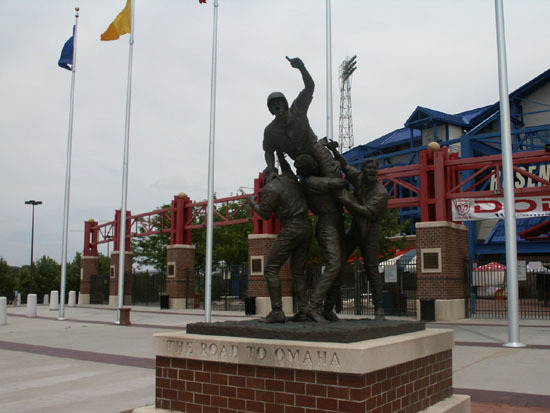 At the time the Omaha team was affiliated with the St. Louis Cardinals against whom they played the opener. 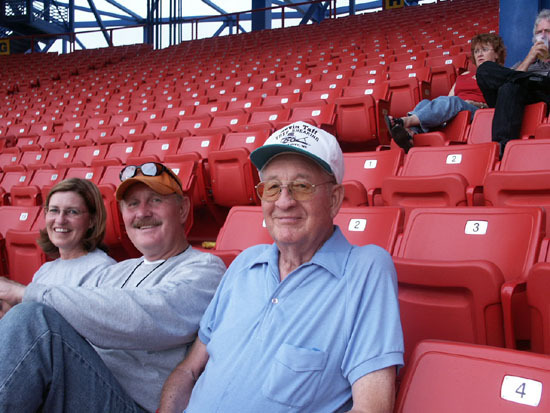 He remembered seeing Stan Musial at the game.